Inside with Palina Rojinski: hosting a Hong Kong travel TV show for Pro7! Farfetch Style Reinvention. If you live in Germany, perhaps you saw me on the new ProSieben series, “Inside – Unterwegs mit Palina.” I was the fixer and on-camera host for this new TV show, which takes Palina Rojinski around the world in search of local experiences. But fist, I want to share with you a new Style Reinvention project with Farfetch, where I reinterpret boy-style for a female wardrobe. It’s always fun to film TV shows in Asia, since this lets me see the latest fashion and trends up close. Right now, Kpop style is everywhere. 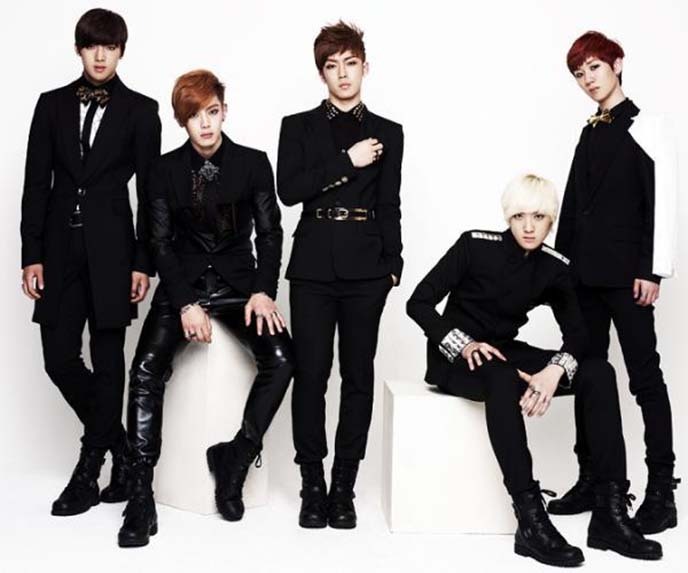 I’m particularly keen on the sleek, black, rocker clothing worn by Korean boy bands such as Excite (above). Kpop male idols have always leaned towards an androgynous look — so why not mix up your wardrobe with some menswear pieces? 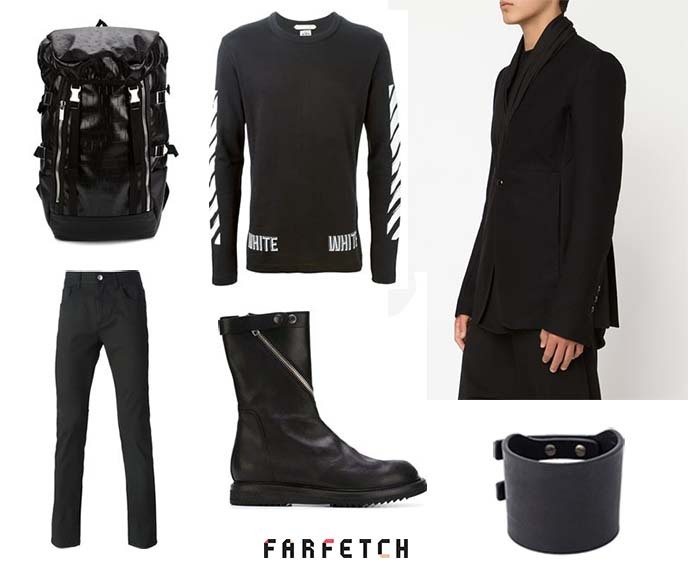 I teamed up with Farfetch to create a “Style Reinvention” moodboard. I had fun breaking out of my usual zone, and browsing the men’s section for ideas. Now, I feel like I can fit in with the Korean boys of the band 24K! 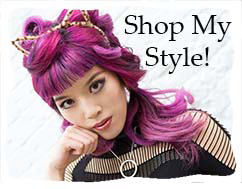 How would you reinvent your style? Farfetch is inviting you to build your own moodboard (like I did), and share it on your blog and social media with the hashtag #myfarfetch. The best outfit, chosen by Farfetch, will receive a £250 voucher to spend on their site. The competition ends Oct 31 — Halloween — so get to it. Can’t wait to see what you come up with. And now, back to the travel TV shoot in Hong Kong. 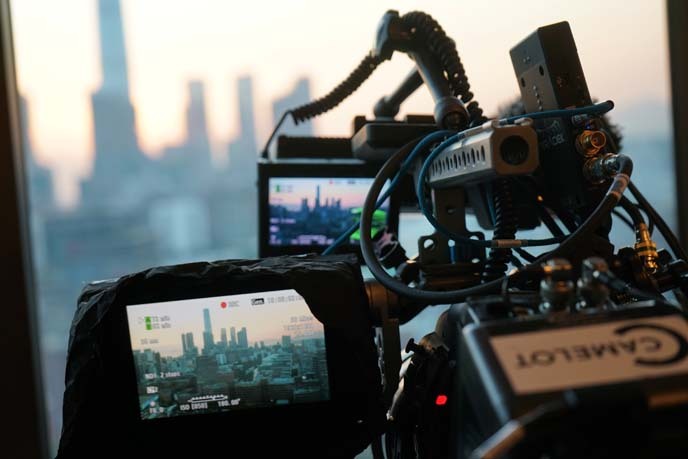 It was a pleasure to work once again with Pro7, the biggest German TV network. 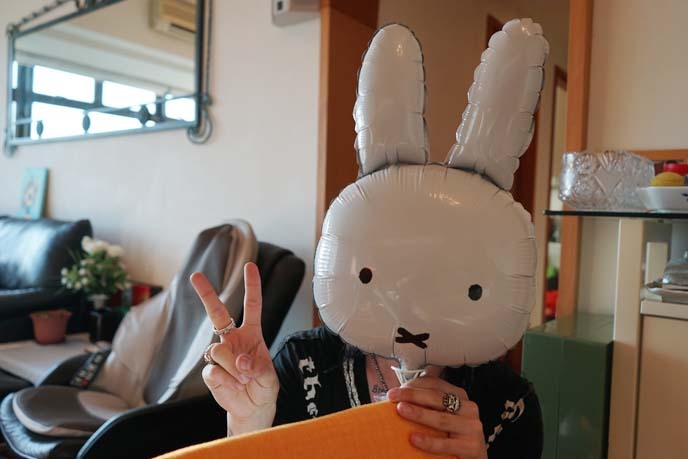 I previously filmed with them for Joko vs Klaas in Vancouver (where we sewed Joko’s lips together), and Tokyo (where we gave Klaas a bagelhead). While I can’t release the whole episode, I put together some of my TV clips in the video above and on YouTube. I also have behind the scenes photos and stories to share — so read on for martial arts, horse racing and snake soup! 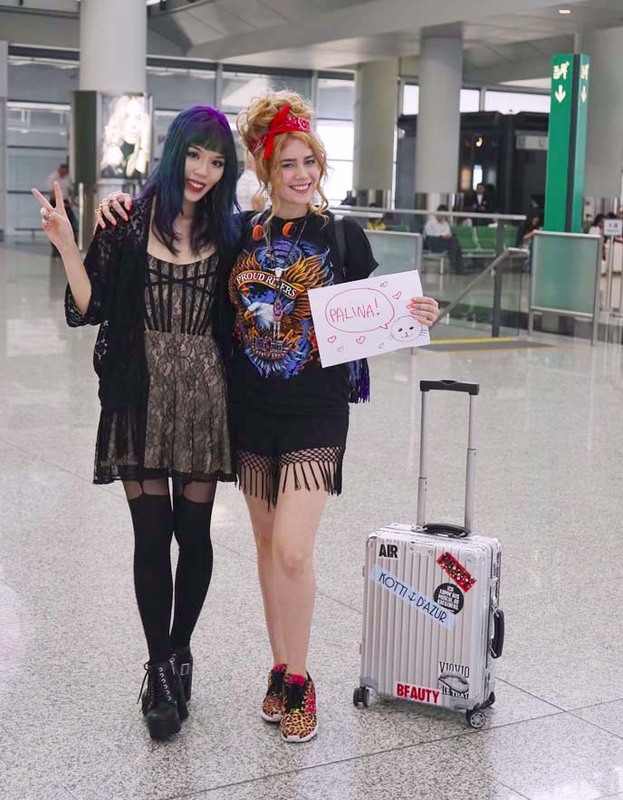 I was Palina’s on-camera guide to Hong Kong, in this episode of “Inside.” For the first scene, I met her at Hong Kong airport. If you’re from Germany, I am sure you’re familiar with Palina Rojinski. She’s a DJ and popular TV host, and we hit it off straight away. 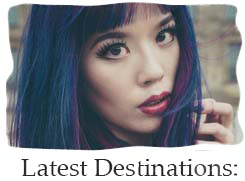 The concept of the show is that Palina wants to get offline, and travel around the globe without the help of cell phones, computers, or money. 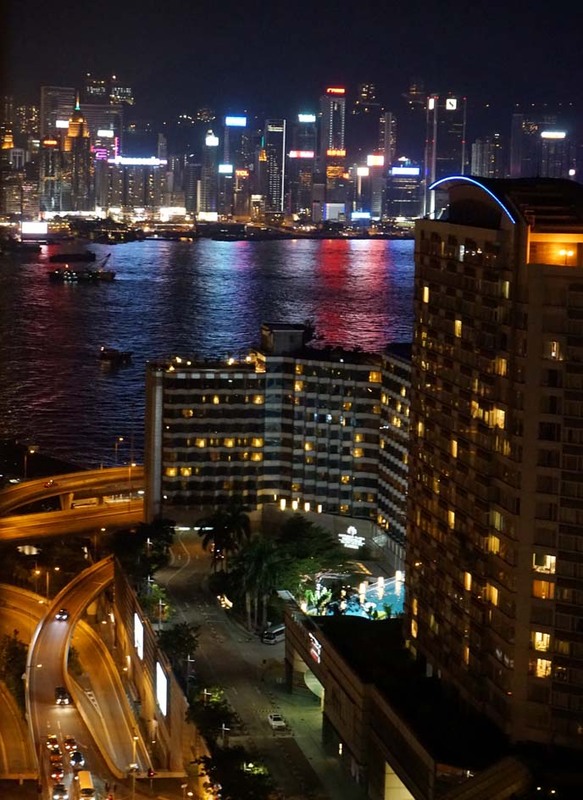 As her Hong Kong local insider, I was excited to show her the city’s wildest nightlife and food. 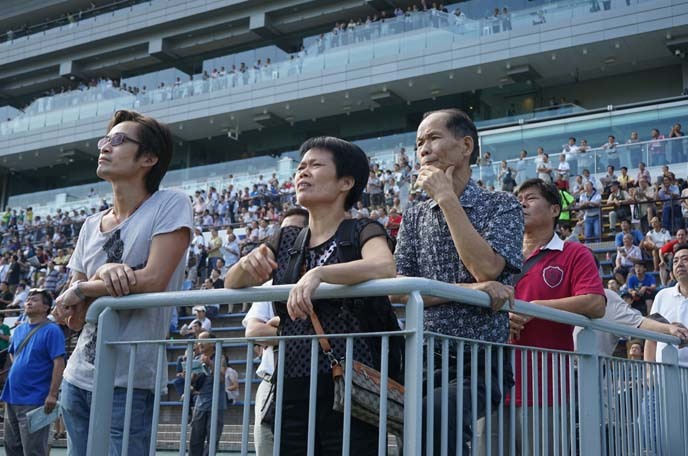 We filmed a thrilling scene at the Hong Kong Jockey Club race course, in Sha Tin. People placed bets on horses, and cheered like maniacs when their favorites galloped by. 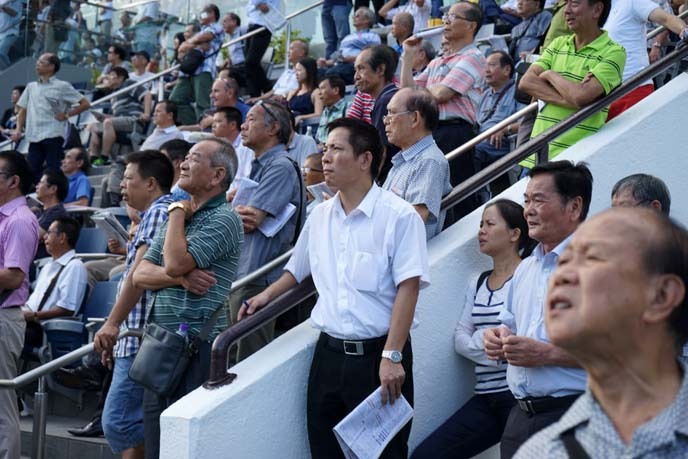 This photo gives you a sense of the excitement in the grandstands, as betters cheered for their favorite horses and jockeys. 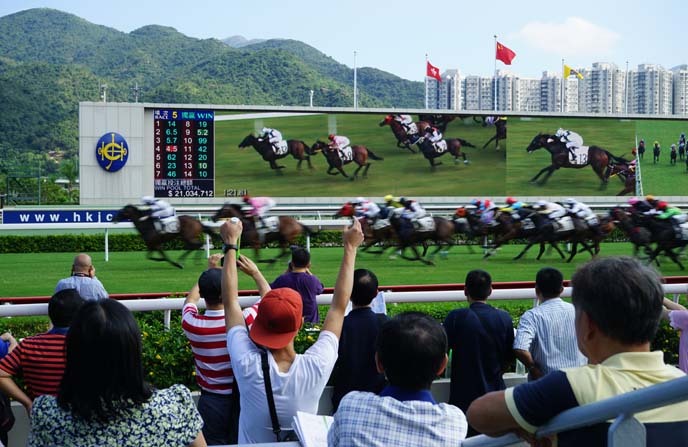 Horse racing is a popular attraction in Hong Kong, a former British colony. My friend John Skeleton and I were the odd Goths out, in this racecourse filled with older men! John was my fixing partner for this German TV show, and led all the scouting and first day’s shoot. 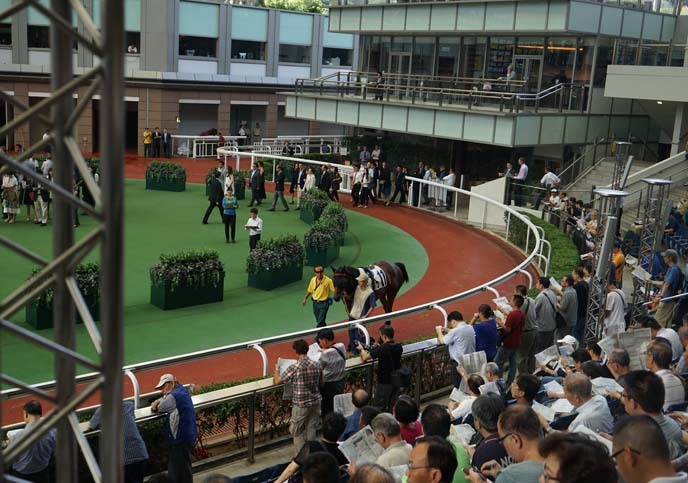 On this turf, jockeys paraded their horses for the spectators. 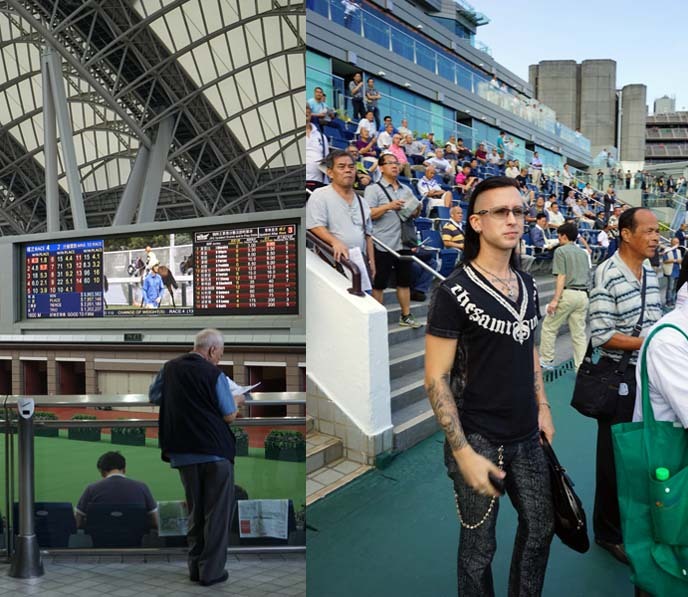 I’ve only been to the Hong Kong horse races once when I was a child, as it’s not exactly my scene. However, it was fun to film here with the TV show. Palina placed a bet on a horse — and with the magic of TV, she won! This was a very special scene… because it starred my cousins, uncle and aunt! As you probably know, I have many relatives in Hong Kong, and they generously opened up their apartment to Palina and the TV crew. 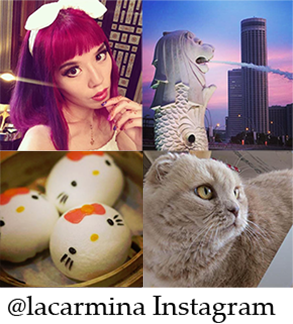 Palina and my family chatted about growing up in Hong Kong, and all the cultural quirks. 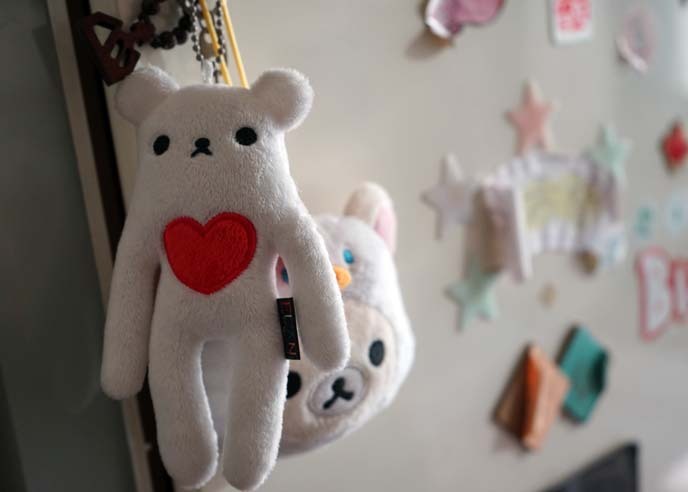 They offered her local snacks, and let her sleep in my cousin’s bed… surrounded by cute stuffed animals. The B-roll camera did a time lapse of the sunset. My uncle’s apartment has a marvelous view of the harbor. Can you imagine looking outside, and having this as your view? 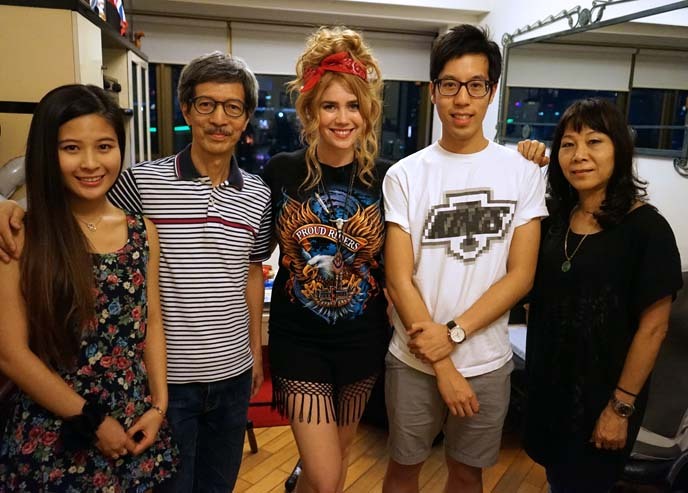 Palina loved meeting my family members and learning about their cosmopolitan lifestyle in Hong Kong. Palina Rojinski insisted on taking selfies with all of us, and left adorable notes for them, written in Chinese. On another day, I arranged for Palina to visit a villian hitter. 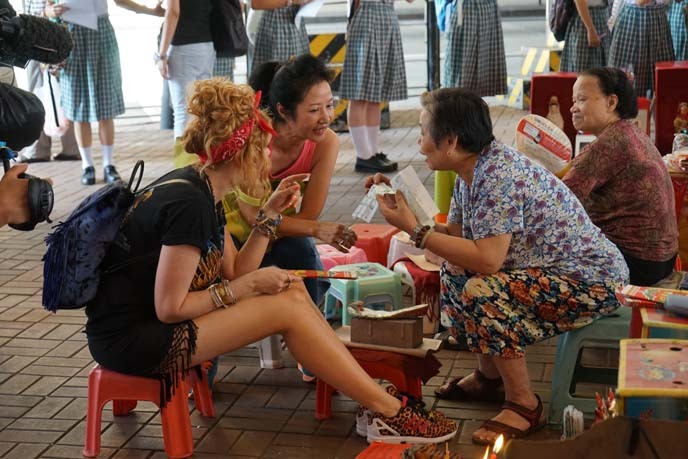 These women set up stalls beneath the overpass of Causeway Bay, around Hennessey Road. 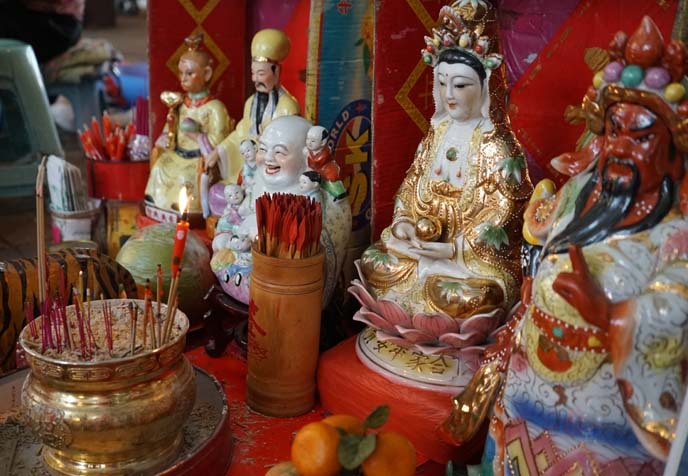 They offer a menu of spiritual rituals that drive out negative feng shui. 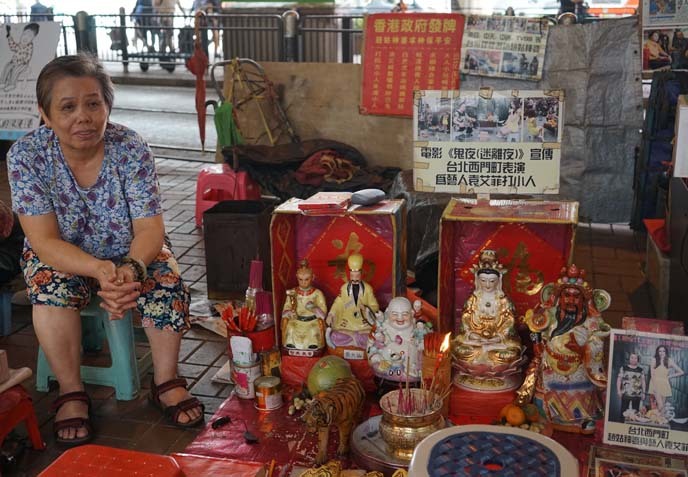 This lady set up an altar with incense and statues of the Chinese folk gods, including the red-faced warrior Guan Yu. My aunt appeared in the TV program, as Palina’s Cantonese translator and guide for this scene. She introduced her to the villain hitter, who performed a dramatic ritual that stamps out bad luck. She burned papers and beat an effigy, to vanquish Palina’s enemies. 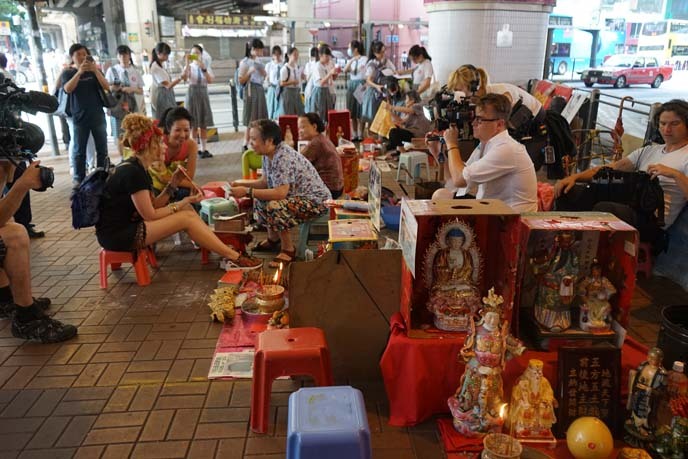 It’s quite the ritual, and worth witnessing if you’re in Causeway Bay. 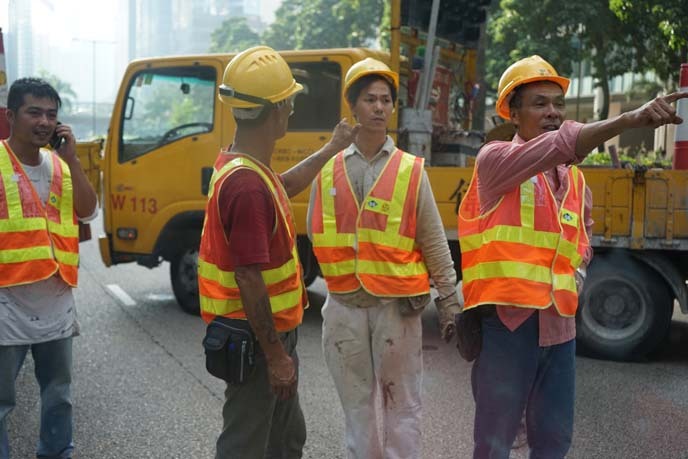 Talk about bad timing… We ran into a traffic jam, near the Hong Kong government buildings. A huge crowd had gathered there. What was going on? Later that evening, we looked up at a TV screen… and couldn’t believe our eyes. 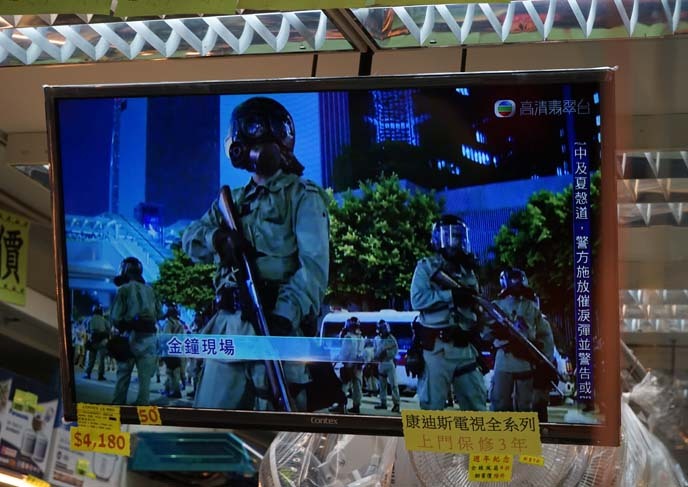 The Hong Kong protests had broken out into chaos, with police firing gas into the crowds. This was the start of “Occupy Central,” and we had missed it by a hair. Regardless, the show must go on. 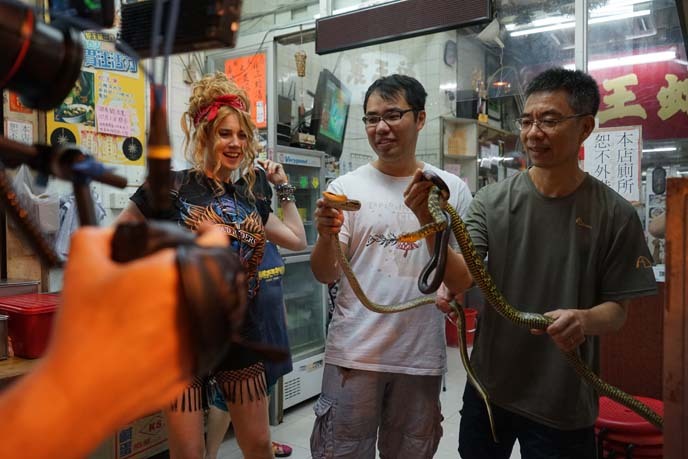 Palina was up for a food challenge, so I set her up at Sher Wong Yip New Snake Restaurant. 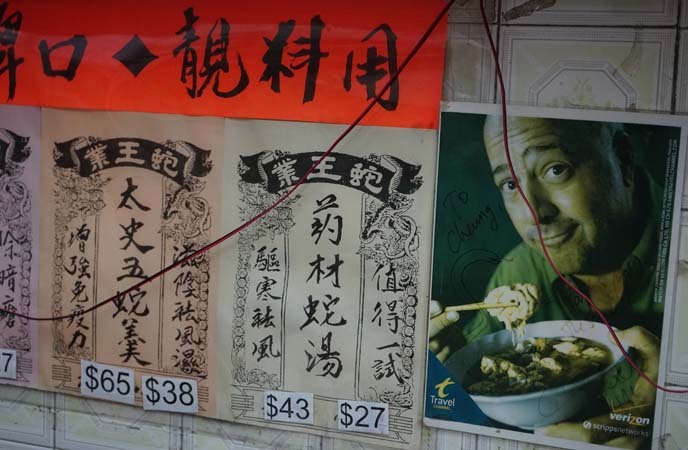 Look who else has eaten snake soup here… My friend Andrew Zimmern of Bizarre Foods (Travel Channel)! Remember when I took him around to Tokyo restaurants for his TV show? At the entrance, there was a big glass case filled with writhing snakes. 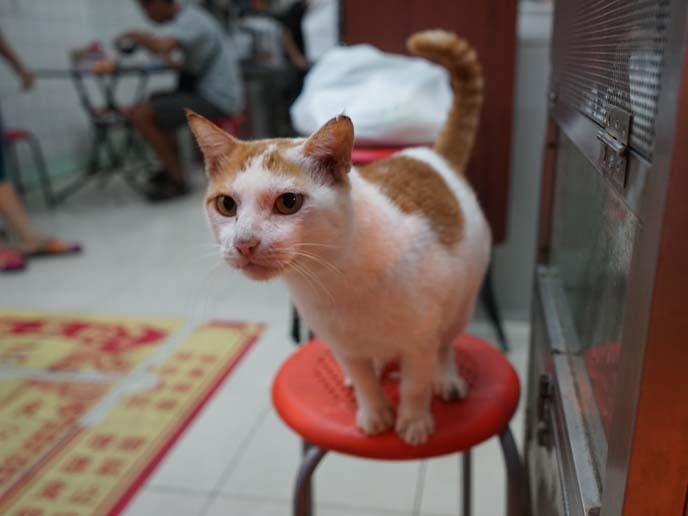 This cat sat right next to the snakes, and didn’t seem at all scared. The owners held up snakes, for a teaser shot. 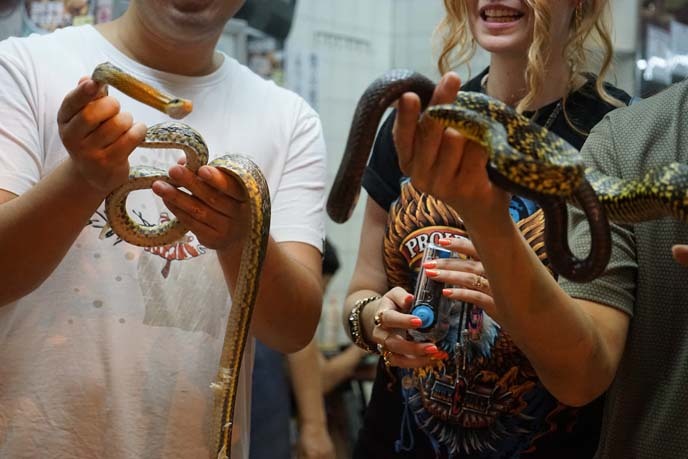 In Hong Kong, people traditionally ate snake soup to “warm up the body” and for its supposed medical benefits. 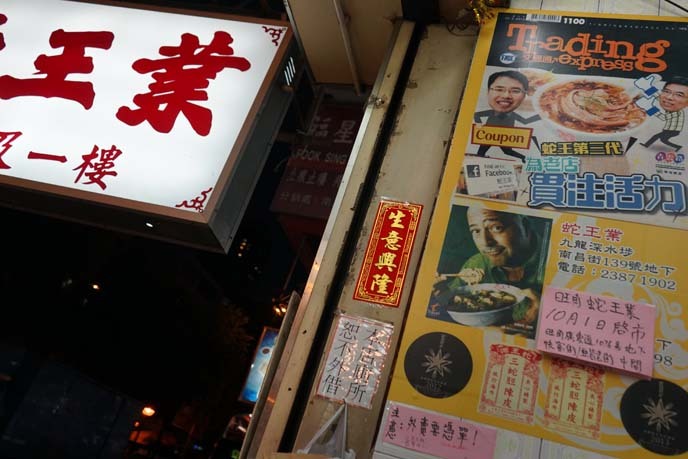 The taste of snake soup? Just like chicken with herbs. I bet you wouldn’t even know you were eating a serpent. We ended the Offline TV shoot with a bang. 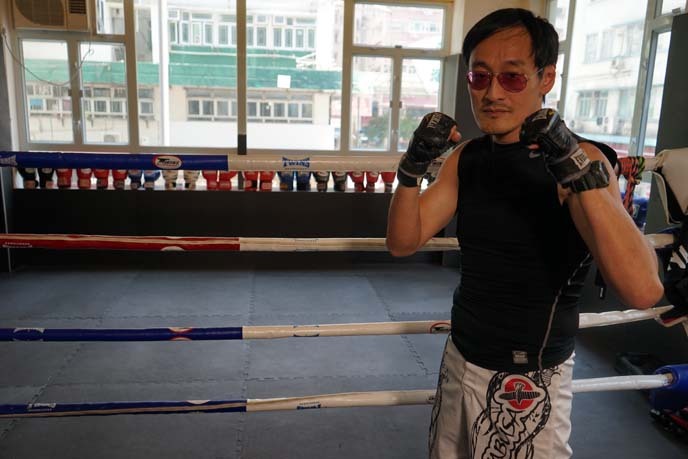 Palina had to fight one-on-one with martial arts expert and filmmaker, Sam Leong. He taught her some killer moves at his Kowloon fighting studio. Then, we drove to this epic location overlooking Hong Kong, for a kung fu death match! Take a moment to watch my German travel TV show appearance, and let me know what you think. Thanks to all my friends and family for making this episode a success. We couldn’t have done it without you. I would wear kpop boy clothes too. Good idea. I love my Kpop boy style. Cool show girl! Get it! 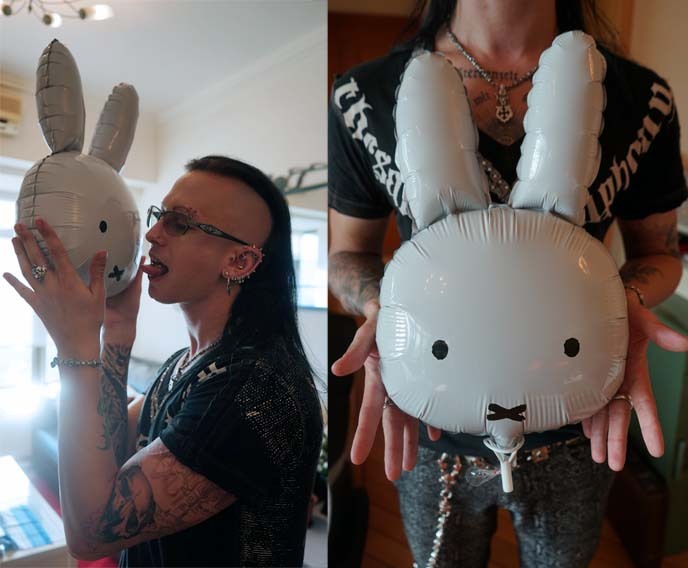 Homg U did a show with Palina. I am from Germany so i know well. Oh awesome that you know of her! Congratulations on the tv show. I saw you on Inside!!!!!!!!! Hong Kong looks like fun. I wish I could see the whole episode, too bad I don’t live in Germany!